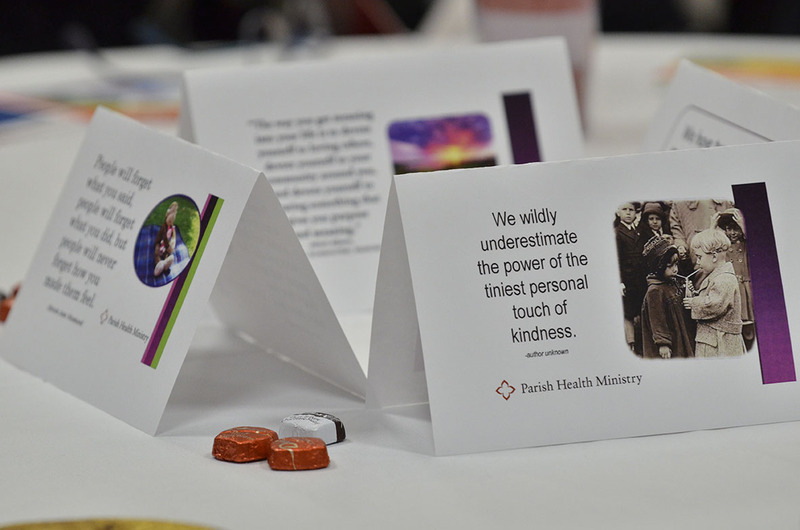 Parish Health Ministry (PHM) provides partnering congregations with a variety of holistic activities and tools that focus on helping members live well. PHM has touched the lives of thousands of people with nearly 30,000 contacts annually through health screenings, educational efforts, and programs. "Stayin Healthy" Fall Prevention program: A compilation of National Fall Prevention educational information, programs and resources which are organized in such a way to assist our partners as they educate older adults and their caregivers about fall prevention. Within the manual is a list of suggested ways to easily utilize or implement the information provided. Yellow Dot program: The Yellow Dot program is designed to help people with current medical conditions communicate with the fire, police and paramedics in the event of an automobile accident. It helps victims communicate with rescuers during the crucial “golden hour.” The first 60 minutes after a serious accident can make the difference between life and death for the critically injured. Journeying through Grief: This program provides PHM partners with a meaningful way to reach out to those grieving following the death of a loved one. It includes a set of four booklets given at specific times during the first year after the loss. It also includes a giver’s guide, points to consider, bulletin information, and Healthy Thoughts articles on grief and grief resources. Click here for more information about this program. Kindness Quotes & Holy Humor CD: This CD offers a number of meaningful quotes and humorous brief stories presented in a colorful and creative way. They can be used in church bulletins, newsletters, email communications, table tents or as part of a PowerPoint slide show at church functions, and much more. Also included are two articles on the effect of kindness and humor on a person’s overall health. Click here for sample image. Backdoor Reading: This program provides a unique means of communication with the congregation regarding health matters. Carol Sullivan, a parish nurse at St. Anne’s Parish in Annapolis, Maryland, has developed over 40 one-page informational sheets with colorful pictures and information about various health topics. This program is available through National Episcopal Health Ministries Association. Episcopal Retirement Services’ Parish Health Ministry has received permission from Carol Sullivan and the National Episcopal Health Ministries Association to distribute Backdoor Reading. Blood Pressure Program: The congregation will be provided with the tools and information needed to implement both a congregational blood pressure screening and a community outreach program. The program includes educational materials and documentation forms. Coordinators may be available for phone or on-site consultation. Blood pressure equipment is available for loan. Volume II: A collection of 24 health and wellness bulletin inserts on topics related to health in body, mind and spirit to share with your congregation in the church bulletin, church newsletter, or on a bulletin board. For your convenience, two sizes of bulletin inserts are included in the binder along with a CD containing all of the bulletin insert information. Click here for samples. Volume III: A collection of 28 health and wellness bulletin inserts devoted to mental health topics to share with your congregation in the church bulletin, church newsletter, or on a bulletin board. As with Volume II, for your convenience, two sizes of bulletin inserts are included in the binder along with a CD containing all of the bulletin insert information. Click here for samples. 5-A-Day The Healthy Way nutrition program: This spiritual nutrition program is designed to help parishioners make a lifestyle change that will enrich their body, mind and spirit. Currently out-of-stock. The Portion Plate Program: This program is a fun, family-oriented way to cut down on portion sizes and discover healthy food options for better health. This program is very popular and has been requested and used in many congregations throughout the country. Walk 50 Miles in 50 Days: This popular, spiritually based walking program encourages participants to walk 50 miles in 50 days to improve their health and well-being. It also serves as a tool to increase awareness of the benefits of walking. Friendly Visitor program: ERS offers support to recruit and train volunteers to visit home-bound individuals and befriend them as a means to alleviate issues of isolation and loneliness. This service also helps individuals to stay connected with the church. Support & Networking Group: This group enables individuals involved in the health ministry to network, share ideas, offer support and obtain information on a variety of wellness topics. Vial of Life: ERS provides free vial containers, forms and magnets to partnering congregations as part of this service. Members use the vials to house health information that is easily accessible to medical personnel during emergency situations. Walk to Bethlehem: This program encourages walkers to become more physically active while providing a purposeful activity involving body, mind, and spirit. The program was developed by the health ministry team at Lake Shore Presbyterian Church in St. Clair Shores, Michigan in 2002 and distributed through St. John Health System. ERS’s Parish Health Ministry has developed additional beneficial tools to this program to further engage participants. *Non-partnering congregations can access Parish Health Ministry Health and Wellness programs by contacting Jeanne Palcic at (513) 979-2238. We do ask that our partnering congregations be up to date in submitting their Report of Activities forms before enrolling in new programs. Click here to donate directly to Parish Health Ministry.